Product ideas can be difficult to come by, especially ones with true market viability. But coming up with the idea is often less challenging than the sourcing of those products – so I found out. There are pros and cons to each method and many retailers use a combination, or all four, to truly scale. Typically, only those brands with high revenues and margins can account for the initial spend, and continuous upkeep, required to offer customers the best of all sourcing methods: unique products in combination with anything and everything else for which they may be looking. These brands are often considered lifestyle brands, offering everything a customer might need to live a particular way –– think Goop, ShopBop, Madewell, ModCloth, among others. Small businesses have long been hindered by the price barrier here, but one big name brand making serious headlines is changing all of that – enter, Alibaba.com. If you follow business or ecommerce news in the slightest, you’ve heard of Alibaba, the Chinese ecommerce company providing manufacturing sourcing options for businesses of all sizes at incredibly affordable prices. In all, Alibaba doesn’t operate exactly like any other ecommerce company out there. For one thing, Alibaba is a comprehensive directory of suppliers, connecting them directly to buyers from all over the world (i.e. retailers). Alibaba presents millions of products to source, all from the suppliers themselves. In essence, you are getting supplier prices at insider rates, typically at a price point only senior and seriously connected merchandisers have before been able to nab. Alibaba levels the sourcing playing field for legacy brands and small businesses alike. How do I know that Alibaba is leveling the playing field for all businesses? Because I started an online business myself, sourced from Alibaba and am seeing huge success. Here’s exactly how I did it (and you can, too). I’ve always wanted to start my own online business. But wanting to start your own business is one thing; actually doing it is another. So, in 2017, I made a New Year’s resolution to start an online business – and I kept it. I finally was able to get my business off the ground. The sense of fulfillment, excitement and pride that I’ve experienced every day since starting my online business has been unmatched. And I did it by starting with sourcing from Alibaba to get my brand up and running, and making money. Plus, I’ll cover FAQs I hear from folks when I talk about this subject, as well as things I wish I’d known when I began. One of the most difficult parts of starting my business was finding a product. I had dreams. I had passion. I didn’t actually have anything to sell. How would I even find a product to sell? What are other folks selling? I had no idea. And I soon came to learn, that’s OK. Fear is what got me to start. It’s what pushed me to search harder. And it’s what brings me to today, a year later –– when I’m able to share with you exactly how I did it, and how you can, too. 1. Do market research to find a product to sell. I did some research on items selling well online, as well as some inner reflection to see if I could find a product that would help solve a problem I experienced in my day to day as a dog owner, athlete, urban dweller and traveler. Using Google Trends, I was able to understand search volume and interest in a number of different products. And then one day, that proverbial light bulb went on. Security restrictions prevented the use of larger backpacks and bags. Festival attendees were left stranded. Where there’s pain, however, there’s opportunity to do something better. I decided I could fix this. I could be a part of the solution. Could I Be the Next Bag Guy? I decided to start my own private label brand of bags and fanny packs: Who’s Your Fanny . Early on, I decided that my business would begin as a private label business. I’d sell via a ecommerce site on BigCommerce and Amazon. This book is no joke. I read it to get started on Amazon – and continue to reference is to grow sales. MSNBC has recommended it. Inc.com has recommended it. I recommend it. Great. So, I have an idea. That’s a start. Now that I had an idea that resonated with me, I needed to validate that this was actually a problem. Moreover, I needed to validate that even if it were a problem, that I could solve it. Most importantly, I wanted to hear from prospective customers. Friends (and friends of friends). Random people on the internet. Google, and evaluated search volume trends. What pain points have you experienced. What sorts of bags have you purchased in the past. How much have you paid. How much would you be willing to pay, etc. I also pulled up that Google Trends thing again. My “mini focus groups” had a lot to say. I had no idea people were so passionate about what they used to carry their stuff. But through that, I identified some crucial elements any solid fanny pack would need to have. Multiple pockets. Compartmentalization was a must. An adjustable belt was key. Some preferred low price; others preferred a cute design. Amazon was where they often began their product search. Guys and girls had different tastes. And there I had it. A product that customers would be interested in buying. And my focus group could also serve as my first customers. But, I still had no idea how I would source this magical fanny pack. 3. Find the best way to source your product. Privately branding your own products. I had to narrow my search. Cost of goods sold must be low to ensure good margins. Products must be tested, reliable and high quality. Manufacturer must be scalable and grow with my business. Running a business often means, on any day, you’ve got 99 problems and I really didn’t want sourcing to be one. I wanted to make sure I had this down pat so that I could focus on running the day-to-day of my business. In general, the framework I used to determine whether my sourcing option was easy often came to whether I could find my ideal product. Is the product light and easy to ship? Is the product price low enough per unit to have a solid margin? Does the product have health risks? No food. No electronics. Nothing like that. I wanted to know my product and have used one before: As an avid festival goer, I had. Confirmed there was a market for the product: My mini focus group did that. Confirmed there was an easy place to source the product from: For this my options were clear –– now I had to decide where I’d source from (Spoiler alert: Alibaba). 4. Decide where you are going to source. Dropshippers like Printful and Printify. Wholesale marketplaces like Alibaba and DHGate. Today, a year later, the business operates with a mix of suppliers. But back then, a year ago, I started with Alibaba as my only supply source. I chose Alibaba for several reasons. I wanted to find reputable fanny pack manufacturers who had been doing this for a while, and Alibaba had plenty of those. I was looking for a known marketplace so that there would be a lot of information on the web about how to use it. Alibaba checked that box. I wanted to ensure that there were rules and regulations on the marketplace to protect myself and any investment I made. On Alibaba, there are rules on how manufacturers and suppliers should behave. There are also tools out there to make sourcing easy on Alibaba. There are reviews of manufacturers, trade assurance options, various security levers. All of these things gave me confidence in exploring it as a sourcing platform. I needed something could fit my budget, so that my investment wasn’t monumental on an idea I was only testing. This was the biggest winner for Alibaba. There, I quickly found products that fit within my budget, manufacturers I enjoyed working with and ones that gave me confidence to move to the next steps in building my business. Now that I had chosen Alibaba, let’s dive in to what happened next and how you can do the exact same thing. 1. Setup your Alibaba account. I did a lot of research prior to beginning my journey but today, I’ll save you all of that time and share what I learned. The first step to using Alibaba is to set up a User ID and password. This is fairly easy to do and straightforward. While Alibaba is based in China, the user interface is in English (and other languages) and caters to a number of different markets. When you get into Alibaba (after you’ve decided on a product), you’ll want to search for a manufacturer. Factory: This is the actual factory that will be producing your sourced goods. Many factories have their own sales teams to deal with retailers like you. Often times, trading companies will source from factories. Trading Company: A middleman that sources straight from the factory and sells to you. In some cases, it may be difficult to find a factory that produces your goods, but a trading company can assist. It’s important to pick which option is right for your business. Many of these manufacturers are flexible in how they work with your business. Both a trading company or straight from the factory can be a good option, so it’s really up to you to determine how you like to work, your relationship and comfort level with the company, the quality of the product and so on. 3. Be smart how you search Alibaba. In the next few sections, I will detail the steps to source a product on Alibaba. In this example, we’ll be taking on the role of a hypothetical hat manufacturer because it meets the criteria we established earlier (easy to ship, low cost, etc.). In this journey, we’ll be (together) starting a hat company. There is a market for hats. 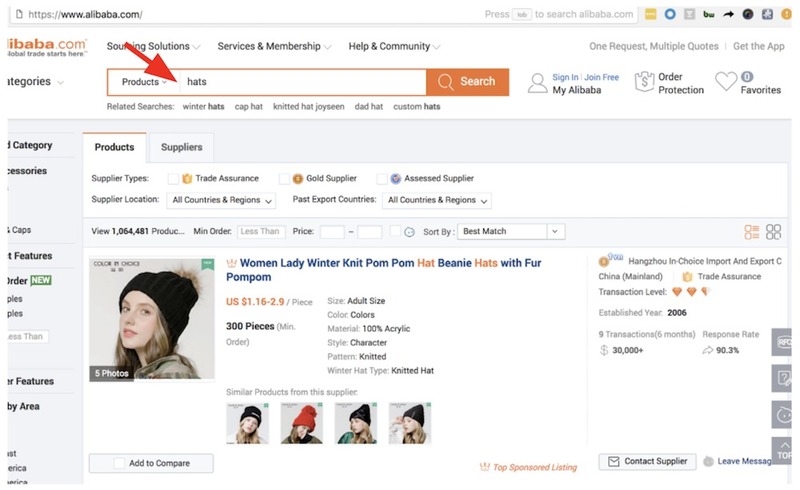 First, go to Alibaba and type in “hats” into the the search bar under “products” and hit Search. In this instance, we’ve picked a broad search term, but the more specific you can be, the better. For example if you are looking for a “winter beanie for women” then you should start with a search for a term like that to get you the best supplier options. In order to navigate Alibaba, here’s a “cheat sheet” on the need to know terms. MOQ: This is the Minimum Order Quantity (MOQ) requirement on Alibaba. It specifies the lowest quantity of a certain product that a supplier is willing to sell. If you cannot reach the MOQ requirement, then the supplier is not willing to enter production. OEM: OEM stands for Original Equipment Manufacturing. You can come with your own specifications, your own requirements, your own detailed visions of your product and hand them off to an OEM factory. The OEM will start manufacturing your product from scratch. This is the kind of supplier you should looking for if you want a unique product under your brand name. ODM: ODM stands for Original Design Manufacturing. An ODM factory will give you products ideas. Give the factory some expected functions, some expected performance and some expected ideas of the conceptions and the factory will suggest some final product options. Don’t know how to build a product? An ODM factory can help. Trade Assurance: If you have a dispute with your supplier, you can submit a claim to Alibaba. They’ll review it, and If they agree that the factory has not made good on their promises, they may give you your money back. Just keep in mind that from the very beginning your sales agreement must list the points that could cause a dispute, like QC, lead times, etc. Gold Supplier: The factory is paying Alibaba to appear more favorably in the search results. It’s a good thing. The factory is pushing their business forward, so take it as a good sign. Assessed Supplier: Alibaba has had a third-party company visit the factory to check out their facilities. IQC: Incoming Quality Control means the control of raw materials or anything that enters the factory (the workplace) for the manufacturing of goods and products. OQC: Outgoing quality control is concerned with the finished goods ready for shipment. QC & QA: Quality Control and Quality Assurance are the ways that quality is controlled and assured during all the process. IPQC: In Process Quality Control is made during all steps of the manufacturing of a given product. CIF: Cost insurance and Freight (named port of destination). Seller must pay the costs and freight includes insurance to bring the goods to the port of destination. However, risk is transferred to the buyer once the goods are loaded on the ship. So, looking at our hat search one more time, we have a number of options. Knowing that this is my first search, I’d like to ensure there are controls in place with a reliable supplier so I select trade assurance, which allows me to pay via escrow after I receive my goods. Also, for added protection, I select “Gold Suppliers,” Alibaba’s top suppliers. While Alibaba is largely safe, there are still all sorts of suppliers on there and these can help you feel more confident you’ll interact with an honest supplier. To further narrow my search, full well knowing that I’m just getting started, I select a manufacturer with a low MOQ of 100. You can select a MOQ that you are comfortable with but 100-200 is a good range for just getting started. Per unit prices will start getting much less expensive at the 500+ range, but you will get there in due time. 4. Pick a supplier on Alibaba. After we’ve inserted this criteria, a number of suppliers will appear. Time listed as a Gold Supplier. In evaluating supplier reputation and reviews, I ask myself a few questions as I evaluate whether the supplier is legitimate. How structured and detailed is their page? Do they have pictures of the factory? Detailed information about the location and history? Do they have professional descriptions and images of the products? Do they describe their QC process and delivery times? Asking and answering these questions should take out much of the fear from your Alibaba search and can help ensure that you work with legitimate factories and suppliers. It’s unfortunate, but there are definitely scammers and fraudsters on Alibaba. However, there are ways to avoid them. Many of the details in this article can help ensure you are working with well-intentioned, reputable, reliable, secure manufacturers. In this example, I quickly identify a supplier that has a good track record, a number of transactions, and has a good response rate. The MOQ is slightly higher than I’d like, but it’s OK.
Now, you’ll want to email several suppliers. Now that you’ve identified some suppliers that meet your criteria (low MOQ, gold, trade, etc.) you’ll be able to shoot them a note and get additional details. In short, your end goal is to determine which suppliers can meet your basic requirements. Depending on your budget, you’ll want to engage a few suppliers for your product. I typically reach out to 5-10 and track my findings in a Google Sheet or Excel spreadsheet. When you engage these suppliers, you’ll interact with them to secure a sample. Samples are important because you’ll want to see the product prior to selling it and investing more money into inventory. Many manufacturers will charge for express shipping via DHL, UPS, FedEx to ensure you get your samples quickly. In some cases, they’ll also charge you for a sample, which can often be refunded once you pick them and place a larger order. Why do Alibaba Suppliers Charge for Samples? Alibaba suppliers often charge for samples and sample shipping to vet that you’re serious about the business relationship. Both sides (you and the manufacturer) want to establish trust. For a business starting out, I’d also suggest sticking to low MOQs to test and validate products before going all-in. This allows you to build trust with your manufacturer to ensure they’ll be able to deliver larger high-quality orders when the time comes. As you build a relationship with an Alibaba supplier, you’ll be able to purchase in bulk, which will give you lower per unit items. But in this initial stage, you’re focused on delivering a viable product. I am a retailer exploring supplier options for my business in Austin, Texas. I am interested in a sample of your hat and am curious as to how much it will cost to ship this item to Austin, Texas. Additionally, I would like to confirm the price per order for your minimum order quantity, as well as turn-around and delivery time. Most Alibaba suppliers respond within 24-48 hours. Does the prospective manufacturer answer all of my questions? Do they show that they can meet your basic requirements? I’ve been very impressed with the relationship management Alibaba suppliers offer. Seriously, no complaints there at all. With that said, Alibaba suppliers are bombarded with emails on a daily basis and it’s important to let them know that you are a legitimate customer. You will want to ensure that you respond in a timely manner to any Alibaba correspondence. Eventually, your supplier will reach back out to you. They will provide answers to your questions and in some cases, offer to chat via WeChat or Skype to further discuss your request. If you have the time, definitely take them up on it. There you can discuss more details about any product customizations you are requesting, pricing and other questions in deeper detail. With that said, it is not required and you can still place your initial order via email. After confirming details with you, they’ll either ask for a small nominal charge plus shipping for the sample. One thing that is important to remember is that sample costs can quickly add up. Be selective in who you request samples from otherwise you may find yourself having lost a small fortune as you scope out new vendors. At the end of the day you’re looking to source a quality product that will still deliver your target profitability per unit. It’s OK to be selective. If it is a trade assurance supplier, they will send you an order in your Alibaba Control Panel confirming your order and transaction details. You can pay for your order via Credit Card, your bank account or AliPay. Since you have Trade Assurance, payment will not be charged until after you receive the goods. This builds shopper confidence as you are only charged once you confirm receipt of the goods. If you’ve used a trade assurance manufacturer, at this point you’ll be able to pay for the samples and upon receipt, will be asked to confirm via Trade Assurance. Depending on whether you are private labeling your product or selling the product as-is, the next steps might be slightly different. If you are planning on selling the product as-is, you’re done. If you’re private labeling like I did, continue. 7. How to private label products from Alibaba. There are two types of private labeling that is possible with products from Alibaba. What is ODM on Alibaba? With ODM, you are essentially buying a relatively finished product and throwing your label on it. You may have a few small tweaks as well. If you’re planning on private labeling the product, you most likely will have a set of designs you expect to print on the pre-manufactured item as well as a tag that has your brand name and other information. What is OEM on Alibaba? OEM is when you start something completely from scratch. In your discussions with the manufacturer, if you have a design that you’d like on this hypothetical hat, you can send them artwork (often in the form of .jpg, AI, etc.) and for a small charge, they’ll be able to put this on your sample. I would highly recommend securing a sample prior to placing a large order, especially if this is your first product. If you are opting for the private label route, you can also often put a tag on the product with your brand. A copy of my own private label used in my fanny packs. It will take a few days/weeks for the sample to arrive, but being the budding entrepreneur you are, this gives you time to build out other elements of your business. Use this time to learn more about Amazon and set up your ecommerce site with stock photography and sample descriptions. If you are sourcing additional products continue explorations. Sourcify is a great option for this. 8. Analyze samples to ensure quality. Does this sample look like the pictures? What is the quality of the product? Is it durable? How’s the stitching? Is the packaging what I expected? Do I need to request something different? Feel free to take the product for a test run. Does it accomplish the task? Does it solve the problem you’re solving? Feel free to also show others. Remember that focus group? Maybe you bring it as your next show-and-tell item. Find your least shy friends that also sit in your target market. Ask and hold your breath. I’m just kidding. Don’t hold your breath. But definitely get feedback! Feedback is important. Additionally, you’ll want to be sure that the price for this product will deliver you your targeted profitability per unit. If the sample is amazing, but the per unit cost will come at an unprofitable price, you should continue to explore additional manufacturers/suppliers. We like our sample and are ready to move forward. At this point, you can reach back out to your supplier to let them know that you like the sample and to discuss terms for your larger purchase. The supplier will send you a trade assurance order form and you’ll place your order. From there, you’ll wait for your products, most likely anywhere from 15-45 days, depending on order size, factory and backlog. For example, if you’re ordering from China during Chinese New Year, expect a delay as many factories shut down for the holiday. At less busy times, you might be able to receive your product sooner. In a couple of weeks (depending on the size of your order), you should receive your products. When they get to you, be sure to inspect them (you’ll want to do this for your future orders as well). Hopefully, the count you ordered, the design and the workmanship will be similar to your sample (and you should be ready to start selling). At this point, take a picture for your product photography and get your products live on your site. And you have your private label product! 10. Continue to get feedback on your product. After you launch, be sure to monitor your inventory levels. Ultimately, you’re going to want to decide as to whether your product will remain viable (i.e. maintain margins, low return rate, etc.) or whether demand is actually quite low. If you do find that your product is successful, you can reach out to your supplier and place larger orders. Remember to continue getting feedback on your products from prospects and customers. Take it step by step and have fun! I continue to grow my business and learn more and more each day. I am so happy that I made that tipsy New Year’s resolution in 2017 and look forward to hearing about your journeys as well. Once you create an account with Alibaba, you can begin sourcing your products immediately. Unlike dropshipping, when you source through Alibaba you will need to house all products yourself. Whether you do that in your home garage or a distribution center is up to you, though there are particular small business tax benefits in the U.S. for designating a spot in your home for this, especially for small businesses. Also keep in mind that you will need to buy your products via Alibaba in bulk (i.e. by the dozen or more). You will also want to be sure that the products you purchase are market viable, meaning that there is a demand for what you will sell. Unit Price: Because Alibaba allows suppliers to sell directly to retailers, prices are generally much lower than you’ll find for similar products elsewhere. This means you can increase your margins. That said, you’ll see FOB often on Alibaba. FOB stands for Free On Board and means that the seller is responsible for all costs associated with getting the product to the dock. After that point, the buyer is responsible for all costs related to transportation from the dock to the store owner. Minimum Order Quantity: This is simply the minimum order amount that the supplier is willing to accept. Keep in mind that this is negotiable, especially with the increased fees associated with shipping once the product reaches port. Payment Options: For most buyers, you’ll likely want to utilize PayPal as your payment option. Escrow is also a good option for buyers, and more often preferred by suppliers. Check out Alibaba’s Payments Page for more information all all available payment options. How does Alibaba handle quality control? Like any online platform, scammers and hackers are always a possibility. Alibaba consistently works to track down and take out those who are masquerading as manufacturers (but whom simply mark up prices, then buy from the suppliers themselves, effectively making them middlemen), and scammers. For buyers, there are multiple ways to ensure that you avoid falling prey to these activities. Choose Escrow as a Payment Option: The escrow payment option holds your payment in escrow (i.e. does not go to seller) until you report back that you have received the products and they are to the quality and quantity expected. This payment option will save you from scammers, though not necessarily false manufacturers. This method will also give you the power to actual see and feel your product before you pay, essentially solving for quality control issues despite your supplier preferences. Contact the Supplier: Sourcing products from overseas can be a bit daunting and frightening for many small businesses. If you are wary about who you are purchasing from, ask them for a contact and set up a call. Skype works perfectly for this, plus you’ll be able to get a sense of the business and the people you will be working with. Request a Quote: RFQ (request for quote), is a simple process and part of the daily interactions between suppliers and buyers. This is your opportunity as a buyer to feel out a supplier’s process as well as negotiate. Simply send the supplier an email and be sure to request information regarding minimum order quantities, production time and pricing, pricing for samples and payment options. Verify Suppliers: Much like eBay and Amazon, Alibaba has a verification system for suppliers, alerting buyers to the historical accuracy of individual manufacturers. Below is a chart showing the different levels of verification. Look for these before you decide to purchase from a supplier. Is Alibaba Safe? How can I avoid purchasing counterfeit goods? Alibaba.com provides a very easy way for trademark owners to report and remove counterfeit listings. But, since not all brands know about the issue, nor do all brands monitor Alibaba.com frequently, there are still many counterfeit goods available. To reduce your risk of importing and selling counterfeit goods unwittingly, try to avoid sourcing any branded goods on Alibaba.com. This is a particularly sensitive issue for luxury retailers. So, if you are looking to diversify within that space, it is recommended that you go through the luxury brand itself to ensure that you are acquiring the trademarked items in question. Fraudulent suppliers will sometimes offer unbelievably low prices, then ask you to pay through untraceable methods such as a Western Union or wire transfer. If such a case happens, you are advised to be cautious. If a supplier places much attention on the payment process (they want to be paid quickly), please take extra care with all elements of the transaction. Generally, suppliers are just as careful as you are about fraud and they will take extra caution and time just to make sure they get your order correct before discussing payment. Call the supplier’s telephone and fax numbers to verify your negotiations with them verbally. Bigcommerce addition: Skype can also be a great facilitator for this. Be cautious if a supplier’s company name and personal name are identical, or if they use free email services such as Yahoo or Hotmail as their primary business email. If you are still unsure of the supplier’s legitimacy, ask to pay for a sample to ensure the supplier’s product is able to meet all your expectations. To answer the original question: yes, Alibaba is safe — if you take the right precautions. Why are there significant price discrepancies between Alibaba products that look the exact same? On Alibaba.com, you will often find a huge range of pricing for a single product. The product was listed at a time when the cost for the item was higher. Now, the price has fallen and those listing the product are pricing it correctly as of current. The quality for one of the items is better than for the other. The company is a trading company rather than a manufacturer (more on this below). The company with the higher price wants to earn a higher profit via their margins. 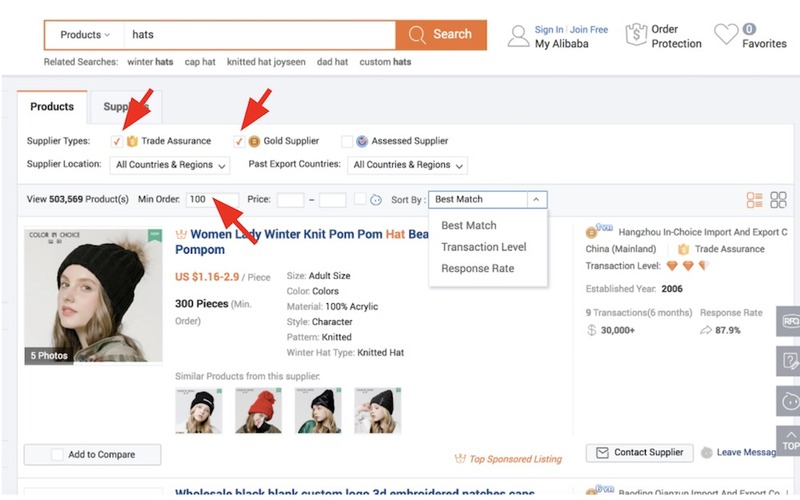 Many businesses looking to source from Alibaba.com assume the price differentiation is due to the latter option, leading them to choose the cheapest item. However, most successful products on Alibaba.com are copied by multiple manufacturers and trading companies in order to pull in more business. To do so, some of these suppliers may lower the product quality in order to maintain margins, but present a cheaper price. Go with the one that is the easiest to work with, taking into account pricing and quality. What are Alibaba’s shipping costs, and why am I not receiving a response from the suppliers? It is wise to contact a supplier before finalizing a transaction. Simply emailing them a letter of inquiry requesting a quote (yes, you can negotiate the posted price on the product page) and samples. Of course, not all suppliers will reply. In order to increase your response rate, be sure to keep your inquiry short and sweet. What is your cost per unit and do you offer quantity discounts? How long is typical production time for a minimum order quantity of Product A? Once I know this, I’ll be requesting a sample and will pass along my mailing address. Thank you so much and looking forward to doing business together. The cost per unit questions should provide an answer for the cost of their samples, at which point you can ask to have them shipped to your address. In all, if you do not receive a reply, don’t worry. Move on to the next supplier. Alibaba.com also offers guidelines for increasing your supplier response rate, below. Keep in mind that Alibaba.com is merely the platform that connects suppliers and buyers worldwide. The company is not responsible for suppliers who do not respond to inquiries. Write inquiries that are detailed and specific. This is to help suppliers better understand your sourcing requirements. Check the “Sent Box” of your “Message Center” to confirm your inquiry has been sent. If your inquiry is not in the ‘Sent Box,’ we recommend re-sending your inquiry again. Call or fax suppliers directly. Their contact information can be found in the ‘Contacts’ page of the Company Website. What is the estimated shipping time for my products? Shipping from Alibaba’s Chinese manufacturers can take a while depending on where you live. Expect in some cases to be waiting up to six weeks for your items. For cost savings, many orders are shipped by boat to foreign buyers (which means if you are sourcing from an Asian manufacturer and you live in North America, your items will likely be shipped). Also, if you are especially concerned with the timing issues related to shipping, you can always source your products from a closer manufacturer. Alibaba.com is akin to the Yellow Pages for manufacturers, and not all of their suppliers are Asia-based. As the platform grows and more international customers begin to use the platform, sourcing options near you will incrementally add up. What do I need to know when it comes to import duties and taxes, as well as customs clearance for the items I’m buying? A great way to handle customs when sourcing products internationally is to hire a customs broker like PCB. At the very least, you can start reading some of the information they have on their site and find a customs broker that services your country. Customs fees are a big variable that will depend on the product, the country of export and the country of import. A great solution to figure out customs is to use DutyCalculator.com. Of course, many of the suppliers on Alibaba.com have U.S. warehouses. If you choose such a supplier, the products themselves will be shipped directly to you and you can avoid import duties and customs clearance. What’s the difference between a trading company and a manufacturer? A trading company often acts as a middleman between the buyer and the supplier. For the most part, businesses prefer to buy straight from the manufacturer in order to cut costs. Trading companies often price their products a bit higher in order to produce revenue. The upside, however, is that trading companies can offer a larger variety of products, allowing a buyer to source from one supplier rather than multiple – as may be the case if a buyer chooses to buy solely from manufacturers. “Factory” means manufacturer on Alibaba.com. Trading companies buy from factories and then re-sell to profit from the price difference. Generally, buyers can get a better price buying from factories directly. Some trading companies unfortunately list themselves as factories, so, be aware. In general, if a company supplies an array of items, rather than a quality selection of a single category (i.e. if they supplied apparel versus if they supply sneakers –– the latter here is likely the actual factory). Ask to see a copy of a factory license. If you are unsure of whether or not your supplier is a trading company or a manufacturer, ask the manufacturer to supply the factory license. After all, you’re already requesting samples. Don’t be so quick to judge. If you find a quality trading company via which you source multiple products without any problems, that’s great! The convenience of finding a good supplier and sourcing all or multiple of your products from them can be worth the extra spend. Can I sell my Alibaba products on Amazon? If you’re planning on selling on Amazon (and depending on the size of your product) you can work with your manufacturer on ensuring it is in the right type of packaging (i.e. if clothing and apparel, a poly pack). Again, many suppliers on Alibaba are excellent professionals and want to set you up for success. So, if you have a question, just ask. Many are quite responsive. Any tips for getting samples from Alibaba? In your first order, decide how much inventory you want and how to ship the items. In your initial order, since you’re most likely testing concept, you may pay a bit extra to get the items shipped to you via air. At this point, this is OK. Focus more on getting your business live, testing, validating and then expanding your business. In all, sourcing products and receiving shipments from Alibaba.com can be a groundbreaking opportunity for your ecommerce business to expand its product offering and ultimately scale into additional categories. Its direct from supplier capabilities can also increase your margins and double your revenue, even if you don’t decide to source additional product categories. As with all platform and technologies, however, you must do your due diligence. Find suppliers, talk to them, build a network, earn trust and take your online business to the next level and grow safely with Alibaba.